Manchmal benötigt man ein Tool, um unter GIMP typische Bild-Manipulations-Operationen wie etwa das Skalieren auf einen Stapel von mehreren ausgewählten Bildern anzuwenden. Es gibt für das Skalieren oder andere elementare Bildoperationen unter Linux natürlich auch andere Werkzeuge zur Bild-Batchverarbeitung. Gwenview z.B. bietet unter dem Menüpunkt "Module >> Stapelverarbeitung" das Meiste an, was der Normal-Anwender so braucht. Aber warum nicht auch ein einfach zu bedienendes Plugin unter GIMP zur Verfügung haben? die gesamte Verzeichnisstruktur als ZIP-file herunter (grüner Knopf rechts oben: "Clone or download") und expandiert es in ein Verzeichnis seiner Wahl. Leider klappt das angegebene Rezept auf einer Leap-(x86_64)-Standardinstalltion nicht unmittelbar, wenn man nicht noch weitere Bibliotheken lädt. 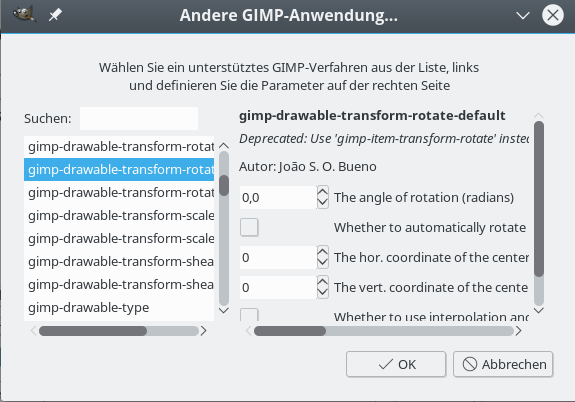 Die im README angegebenen Bibliotheken gibt es aber unter Opensuse Leap nicht mit der für Ubuntu/Debian gültigen Bezeichnung. Treten während der Kompilation Fehlermeldungen auf, etwa zu einem nicht gefundenen "gimptool-2.0", so muss man unter Leap (z.B. mit YaST) vielmehr das RPM-Paket "gimp-devel" laden. Bei anderen Fehlermeldungen ggf. auch noch das Paket "pcre-devel". 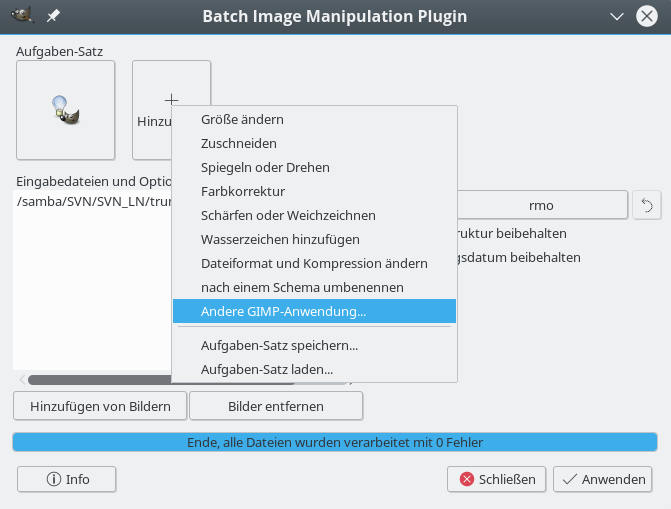 (Ansonsten waren bei mir neben dem "gimp"-Paket installiert "gimp", "libgimp-2_0-0", "libgimpui-2_0-0", "libpcre1", "libpcre16-0", "libpcrecpp0", "libpcreposix0"). Und weitere Bibliotheken, die hier aber nichts zur Sache tun. und dass man jede unter GIMP verfügbare Bildverarbeitungsaktion bei Bedarf aus einer Liste verfügbarer Verfahren auswählen und parameterieren kann. Die Zuordnung einer GIMP-Bildverarbeitungsaktion zu einem definierten Schritt erfolgt über ein Auswahlmenü mit Standardaktionen bzw. dem Punkt "Andere GIMP-Anwendung". Zudem kann man eine Serie von Verarbeitungsschritten auch abspeichern. Einfach, gut und nützlich! Herzlichen Dank an den Entwickler Alessandro Francesconi! IP GeoLocation is useful - not only in the context of professional penetration testing, but also for answering very legitimate questions of both system administrators and normal users. E.g. : Where does my web hosting provider really host my website or all my cloud data? In Germany with relatively strict laws regarding personal data protection, the EU or somewhere else where privacy may not be respected to the full extent I expect? The German provider 1&1, for example, is very active on the French market, too, but at least very many, if not all French websites seem to be hosted on servers in German computation centers. Good to know for a French customer, both legally and also in case of technical problems. Of course, there are GeoLocation services available on the Internet - but the documentation of result data very often is pretty inconvenient. Now, you could write e.g. a python program for GeoLocation on your own - which is a nice exercise, but you will soon find out that you must have a profound knowledge about networking protocol details. So, from the point of view of a standard Linux user or admin it would be nice to have an easy to use, graphical and open-source solution for IP GeoLocation available on the desktop. Such a program is "Open Visual Traceroute" [OVT] of Leo Lewis. OVT is Java based; for IP GeoLocation it uses the CityLight-database of the company Mindmax. OVT has a nice graphical interface for the geographical display of the results of tracerouting. It has some simple but helpful log and documentation functionality - and even allows for some "sniffing" inspection into data traffic on network interfaces. Note that using the latter capability has legal implications - so, always (!) get the explicit allowance from your company owners, if you intend to use this functionality of OVT - e.g. in the course of penetration test. In general: Consider possible legal restrictions of the use of OVT (especially in Germany) - and do it carefully. This having said: Can we technically use OVT on an Opensuse Leap 42.1 system? The answer is yes, but .... The "BUT" in this case does not refer to functionality, but to general security considerations, which we shall discuss in a later article. However, let us first have a look at some elementary obstacles which prevent the successful execution of the program on an Opensuse Leap desktop. Starting the application as a normal user leads to a variety of different error messages from the Java side, problems with X11 access and right problems regarding the essential package capturing functionality. One reason for this behavior is a general problematic aspect of the program: It requires root rights for network analysis capabilities. You think of "sudo" ? Yeah, but .... Actually one can learn a bit about "sudo" when dealing with OVT. In this article I shall describe 3 simple ways of using OVT on Opensuse Leap 42.1. Note that these approaches are only reasonable for single user machines! Actually, due to its special sniffing capabilities OVT is a program to which only selected users should get access to on a multiuser system. In addition running Java and network package analysis as root leaves us with an uneasy feeling .... But let us first get OVT running at all. In a second article we restrict the usage of OVT to selected users - and improve the startup of OVT for these users a bit. During the discussion I touch some general "sudo" issues, which may be useful in other contexts. A third article then argues for using the program in a chroot jail or virtual environment to improve security. I have posted some of my approaches also in the discussion forum of OVT on Sourceforge (https://sourceforge.net/p/openvisualtrace/discussion/1799338/thread/76f2b798/). Installation of OVT is quite simple and basically means to place a folder into some reasonable branch of the file system. A shell script is used to start the program. The web site http://visualtraceroute.net/ offers the download of different installation packages for different operating systems. For our Opensuse system the most reasonable choice is "Download Universal". The zip-file behind it expands on our SuSE machine into a folder "OpenVisualTraceRoute1.6.3" with a shell script "ovtr.sh" at the highest level and some required subfolders below. The additional "README.txt" file informs about the present and older versions of OVT - in my case I used version 1.6.3. On my system I have placed the contents of the mentioned folder into a directory "/opt/ovt/". But you may take another choice. We abbreviate the full path to this installation directory during the rest of this article by "/PATH/TO/OVT/" and call it "OVT-directory". The OVT-directory contains a "lib" subdirectory which supplies the required "jar" archives. In principle the OVT program could be started from the OVT-directory by executing the "ovtr.sh" script there. However, this does not work on OS Leap 42.1 - and results in a variety of error messages. The program must find the "libpcap" library. Actually, in the present version OVT assumes that this library can be found in form of a file "libpcap.so.0.8" in some directory of the PATH environment variable. However, such a file does not exist on Opensuse Leap 42.1! The program needs to run with root rights (or certain network privileges on a system that support file capabilities). The reason is that it uses libpcap, i.e. network packet capturing on detected network interfaces. OVT must find and read the shell environment variable DISPLAY - which under some circumstances is not completely trivial. OVT must get the right to access the X11 display of the non-privileged user who started the X11 desktop. This list is the result of some trial and error testing plus a closer look at some discussions at Sourceforge. 13:01:36.772 [SwingWorker-pool-1-thread-1] WARN  o.leo.traceroute.core.ServiceFactory - Cannot find a suitable network device for tracing. 13:01:36.776 [SwingWorker-pool-1-thread-1] WARN  o.l.t.c.n.JNetCapNetworkService - Cannot find a suitable network device for tracing. Despite the many warnings the application opens and displays the following graphical elements, which are quite self-explanatory. However, if we compare our screenshot with illustrations on the site http://visualtraceroute.net/ we detect that our interface lacks a button, e.g. for sniffing. We come back to this a bit later. The option "Use OS traceroute" is set to "Yes" in the combobox - and, under the given conditions, this option cannot be changed. Give OVT the required libpcap ! The access to "libpcap" is not only required for sniffing, but also for tracerouting! However, still no sniffing button and no change in the OVT settings - OVT still uses "/usr/sbin/traceroute". Does OVT work for user root? "sudo" does not invoke any kind of shell. So, even if the user root had defined special startup scripts for login or execution shells, which specified the export of DISPLAY, such scripts would not be invoked by "sudo" and as a result the DISPLAY variable would be missing. Therefore, Java complains about the X11 DISPLAY variable! But, as we know, on Opensuse systems a graphical program started from a root terminal/shell under KDE does know the DISPLAY variable and does start on the unprivileged user's X11 desktop. So, again: What about turning off the "sudo"? And, hey, we now see the button for sniffing - and therefore know that packet capturing is active. And: By some clever intelligence of OVT's packet analysis we now arrive at the real hosting place of the web address we tracerouted (compare the above image with the first picture where the Linux traceroute was used). Good! I have experienced the better and more thorough analysis of OVT's own traceroute routine in other examples, too. Solution 2: Run OVT with "sudo"-command - but modify it! Take care of the positions of single quotation marks! When we now start "ovtr.sh" as an unprivileged user, we are prepared to enter the root password. And then - what do you guess? What the hack!? However, this problem is simple one. We started Java from a subshell as root. But why should root get access to our X11 display from such an environment? Actually, even root cannot do this without special precautions! 15:40:47.831 [Shutdown] INFO  org.leo.traceroute.install.Env - Preferences saved. 15:40:47.833 [Shutdown] INFO  o.leo.traceroute.ui.TraceRouteFrame - Application exited. Success! But, do not forget to retrieve the access right after having used OVT. My objective in this post was to present some elementary steps to get OVT running on an Opensuse Leap 42.1 system. We have seen that we need to make the right "libpcap.so" library available and that the "sudo" command in the start script has to be adapted to guarantee both the recognition of the DISPLAY variable and the access to the X11 display. In a first test we have futhermore seen that OVT's internal traceroute is a bit better than the standard Linux traceroute. On a multi-user system, however, we need to restrict the access to OVT to a group of trustworthy users. This will be the topic of the next article. 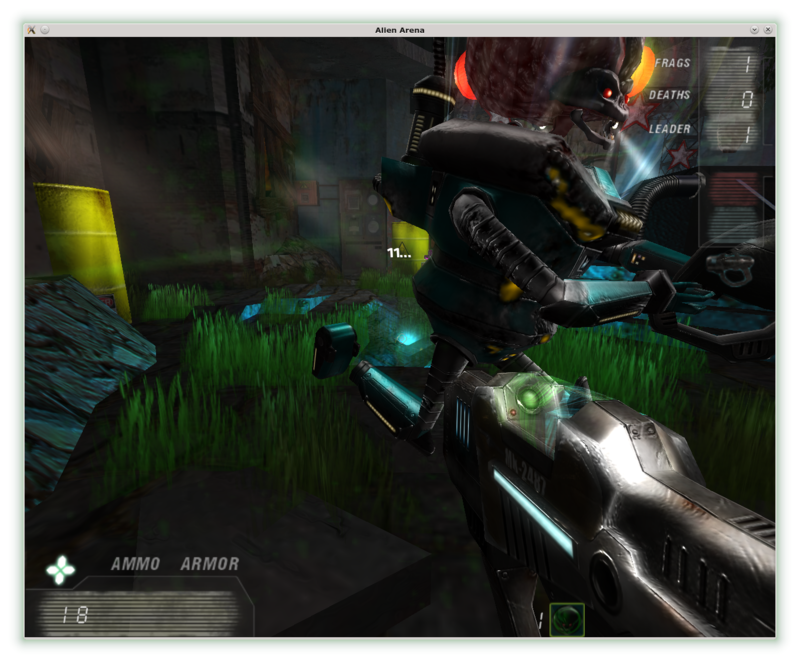 Have some fun with testing out OVT in the meantime!